Preheat the oven to 180°C/350°F. Transfer chicken legs to a parchment lined baking sheet and bake for approx. 20 min. Quarter and core cabbage and peel the onion. Finely slice cabbage and onion and add to a bowl. Core and slice apple. Add ground caraway, sugar, salt, white balsamic vinegar, and vegetable oil to the cabbage and onions and knead roughly until the cabbage is tender, approx. 5 min. Add apple and toss to combine, then set slaw aside. Put the mayonnaise, spicy mustard, grainy mustard, and apple juice into a bowl and season with salt and pepper. Mix to combine. 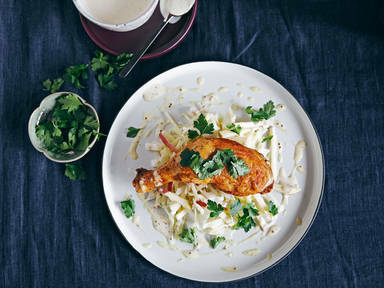 Serve chicken legs with cabbage slaw and mustard dip and garnish with parsley. Enjoy!